Rivercrest & River Valley Bull & Select Heifer Sale Videos Now Available! Click on image or links below to view catalog. 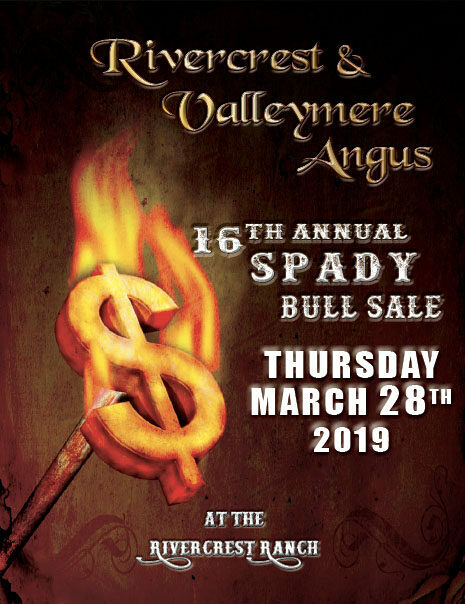 Also photos of all our sale bulls and the select offering of heifers are on our Bull Sale Page so you can click on and see the larger images. There is a proud heritage in the Black Angus cattle at the Rivercrest Ranch. A heritage built on integrity and high principles set by our customers. 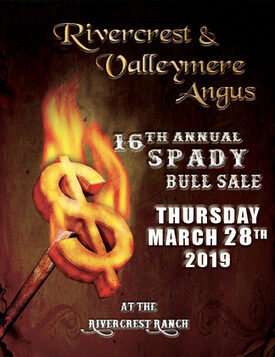 Three generations of the Spady family have been raising registered Canadian Angus cattle under ranch-raised conditions. Fertility, good hair, easy-doing, soundness and longevity are among some of the traits we have bred on since the 1930's and still do today. Our ranch, located in the Battle River Valley, provides a true test to our ranch-raised cattle as they spend most of their time trekking river hills and valleys in the native terrain. The Spady cattle will get the job done and we stand behind them all the way! Thank you for taking the time to visit our website. If we can be of assistance or if you have any questions, please contact us by phone or send us a message using our contact form. Deb, Tom, Marg, Sherri and Craig (2nd and 3rd generation Angus breeders).